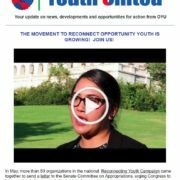 On September 26th, 2018, we celebrated the one-year anniversary of the Reconnecting Youth Campaign – a national campaign calling on Congress to invest in America’s future by funding education, training, national service and employment opportunities for one million Opportunity Youth (young people ages 16 to 24 who are not in school and not working). This in-person meeting not only marked one year since our launch, but it also gave us a moment to celebrate our significant success. I felt proud to report out with my colleagues that the fiscal year (FY) 2018 budget had a $118 million dollar increase in funding for programs that serve Opportunity Youth from FY2017 levels. In a time when most thought it would be impossible for an appropriations campaign to have any success, we defied the odds. We showed that when we stand united, we can create the political will to make the investments that our country desperately needs. Every time we met we asked ourselves who is in the room, and who else needs to be. To ensure that each of the 4.6 million Opportunity Youth in our country have a bridge to education, career, or national service opportunities, we knew we had to grow; we had to reach beyond our capacity at every level. We needed everyone. With each passing month, the campaign grew. 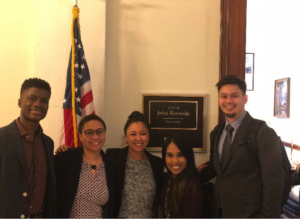 As a result, when we circulated our letter calling on the Congressional Appropriations Committee to increase funding for the federal programs serving Opportunity Youth, more than 50 organizations from across the country signed on. In this first year, our quarterly in-person campaign meetings represented our membership’s commitment: we always had a full house. 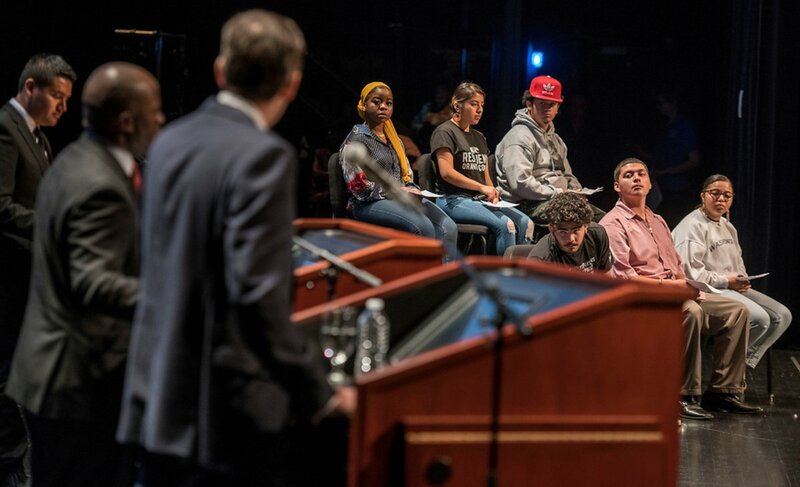 One of my favorite parts of our meetings is the “State of the Issues Policy & Messaging Fair,” an opportunity to get updates from many of the systems that affect Opportunity Youth, from criminal justice system, immigration, and homelessness, to safety net programming, apprenticeships, and child welfare. It is always fantastic to be able to hear and interact with experts in their respective fields in small groups. As a campaign, we have been through a lot together. When we were in the early planning stages, I remember we had tough conversations with some of our colleagues about our goal. Some thought our ask was too high, too “aspirational,” especially in our current political climate. Many of the budgets coming out of the executive office called for cuts and even eliminations to some of our programs. We knew that if we really wanted to provide pathways to opportunity for Opportunity Youth, we had to have the audacity to try. We had to stand up and advocate for our communities, and that is what we did. 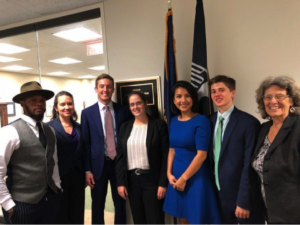 Coming into our one-year anniversary we had almost 40 meetings with congressional staff, and our passion for the work didn’t stop us from having nearly a dozen more meetings later that afternoon. We were pleased that Members of Congress circulated a bipartisan “Dear Colleague” letter asking colleagues on the Appropriations Committee to increase funds for effective programs. Our tenacity paid off, and two days later, a Labor, Health, and Human Services (Labor HHS) appropriation bill was signed into law that provides a $210 million dollar increase in funding for programs that serve Opportunity Youth in FY19 from FY17 levels. Since the campaign has started, we have seen a $329 million dollar increase in funding for programs that serve Opportunity Youth! 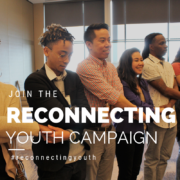 The Reconnecting Youth Campaign is proud of our collective efforts to educate Members of Congress about the vast potential of Opportunity Youth and how every $1 invested in helping a young person reconnect yields more than a $5 return on investment. Investing in our youth is the best possible investment we could make. Reaching out and securing bipartisan champions to support key investments has been crucial. While we have come a long way in our first year, we continue to work toward a more significant investment that would reconnect 1 million young people per year to education, careers, and service opportunities. We have much work to do in FY2020, but together we are making the difference. 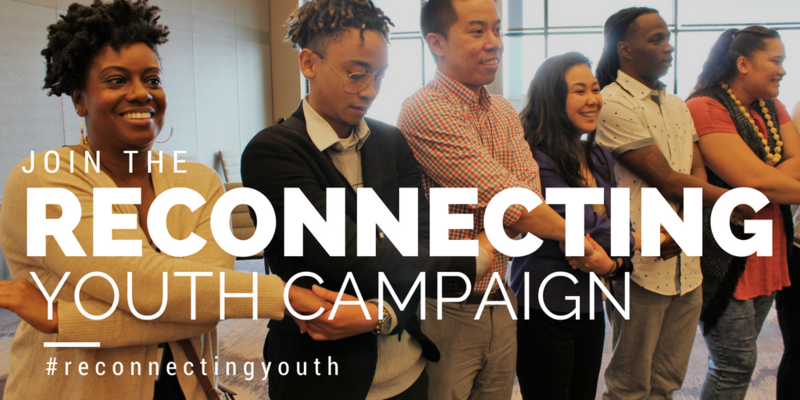 To learn more about the Reconnecting Youth Campaign, click here. While national elections get the media attention, local elections in many ways have a more direct impact on people’s lives, including the quality of roads and transit systems, the schools our kids attend, parks and greenways, public safety, and more. 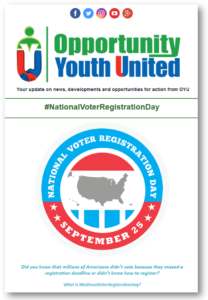 This issue of OYUnited’s e-newsletter helps to inspire, educate and provides tools to help you register to vote. Read the full archived September 25 newsletter here. 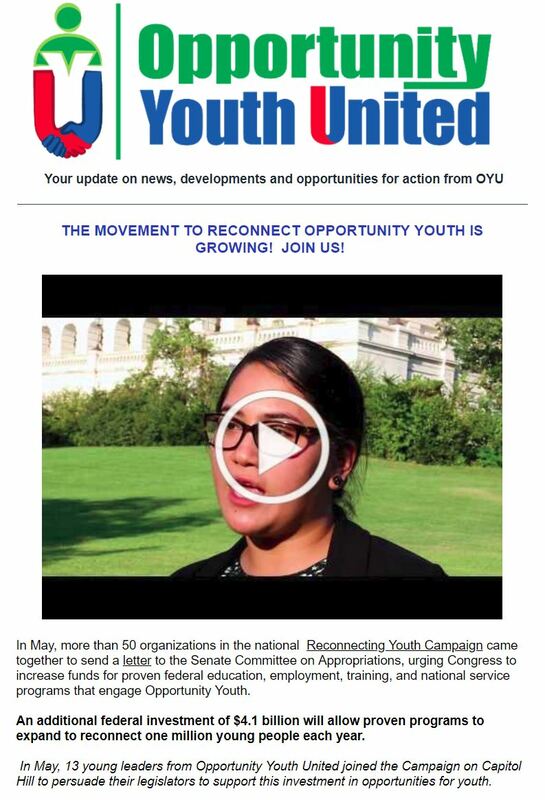 http://oyunited.org/wp-content/uploads/2018/11/Septnewsletter.png 947 658 Danielle Varner http://oyunited.org/wp-content/uploads/2018/02/oyu-h-1-300x104.png Danielle Varner2018-09-25 19:44:202018-11-28 20:07:03OYUnited: Today is #NationalVoterRegistrationDay! 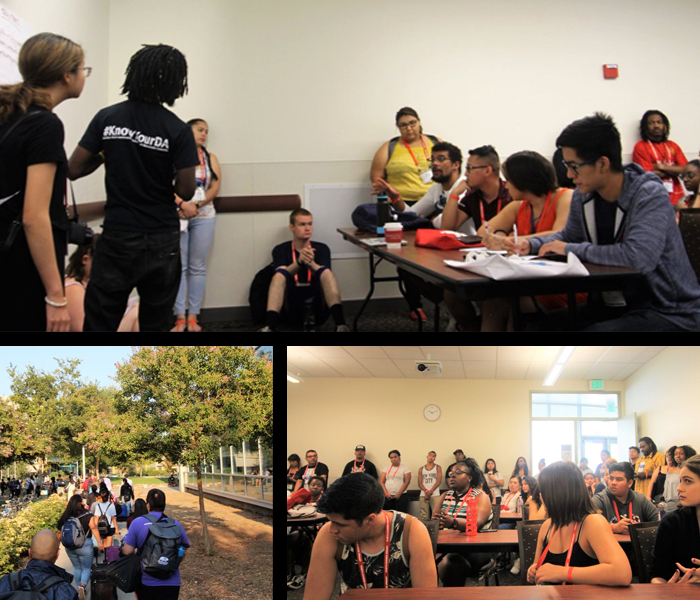 August 10, 2018 – It was a hot California day, with temperatures reaching over 100 degrees, but the high temperatures would not dissuade over 300 young changemakers from across the state of California from descending on the University of California Davis campus for the 2018 Youth Power Summit, hosted by PolicyLink in partnership with the Alliance for Boys and Men of Color and numerous local partners (see the full list here). 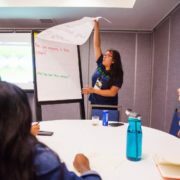 The purpose of the event was to strengthen youth movements across California by bringing young activists together for a three-day weekend to hone their skills, share best practices, and build community while they advocate for a better future for all Californians. With the focus on building youth-led movements, Opportunity Youth United, of course, was there in force with our Los Angelos, Sacramento, San Francisco, and Oakland Community Action Teams (CATs) in attendance. Their Saturday started on a high note during the regional breakout sessions focused on quality education throughout California. The young leaders split into groups by region to identify problems in their local schools, brainstorm solutions, and recognize their local decision-makers active on the specific issues. The workshop seamlessly built a sense of community across the state as young leaders began to see the common threads across their communities. As the day progressed into the afternoon, the nonpartisan Superintendent Candidate Forum went into full swing as the two leading candidates for the office of California Superintendent of Public Instruction, Tony Thurmond and Marshall Tuck, faced off and answered questions from the moderator and from a group of the young leaders. Young people ask the candidates questions during the forum. 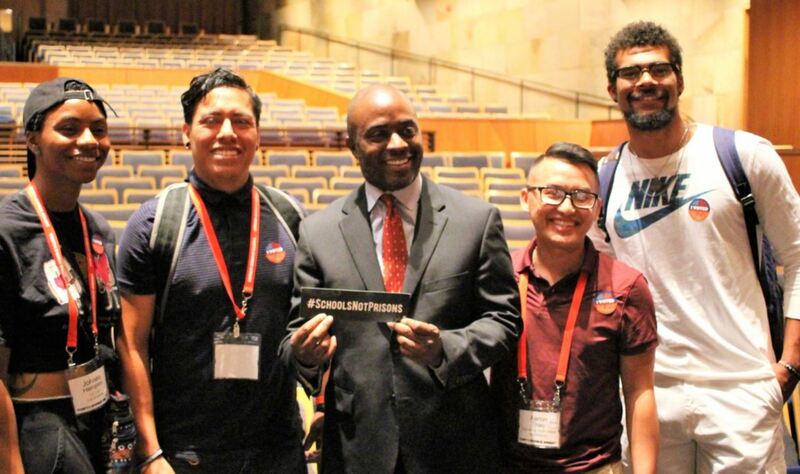 In addition, with a little bit of coaxing behind the scenes, we were able to arrange for representatives from our California youth-led CATs to interview the candidates in a small informal group. Both candidates were gracious enough to accept, allowing the OYUnited CAT leaders over 30 minutes of uninterrupted conversation. The California OYUnited members showed up, stood up, and spoke up about real problems their school systems were facing and asked important questions. California has more than 6 million public school students; the Superintendent selected in November’s election will lead the country’s largest and most racially diverse school system. Both candidates were prepared to address the issues and gave thoughtful responses to each question. Sunday was another action-packed day as the young leaders prepared for over 100 legislative meetings in total at the California State Capitol in Sacramento. 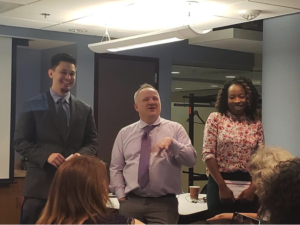 The first part of the preparation was the young leaders learning about the nine bills that were identified by their organizations as good bills to support heading into the summit. Each participant chose a system they were passionate about — for example, police accountability, transparency, education or workforce issues. 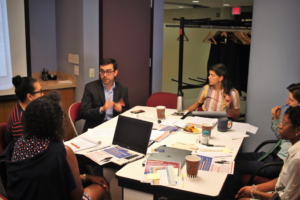 They then learned about the bills identified in those sectors: what the bills propose, the problems they were designed to address, and the talking points and messaging for each bill. After these workshops, the young people met in their small groups for a training on best practices and general expectations for meeting with legislators, and of course, had fun engaging in role-plays to prepare. AB 931 (Weber) – Changes the standard by which law enforcement officers can use deadly force. SB 1421 (Skinner)– Allow public access to police investigations, findings, and discipline relating to deadly and serious uses of force, sexual assault against a civilian, and proven dishonesty. SB 439 (Lara & Mitchell) – Would exclude children 11 years old and younger from prosecution in juvenile court, protecting them from the negative impacts of formal justice system involvement. |or| Setting a minimum age for Juvenile Court prosecution. SB 1391(Lara & Mitchell) – Prohibits children age 14 and 15 from being tried as adults in criminal court and being sentenced to time in adult prison. SB 1437(Anderson & Skinner)- clarifies that a person may only be convicted of murder if the individual willingly participated in an act that results in a homicide or that was clearly intended to result in a homicide. SB 607 (Skinner) – End of willful defiance/disruption suspensions and expulsions. AB 2772 (Medina) – Ethnic Studies Requirement. AB 1639 (E. Garcia) – California Victim Compensation Board, this bill ensures that alleged gang affiliation and immigration status don’t preclude someone from Victims Compensation Fund eligibility. AB 2138 (Chiu & Low) Access to Occupational Licenses for formally incarcerated people. The capitol visit day was a strong success. Our young leaders came prepared, shared their stories, built relationships with their elected officials and helped move the needle towards a better future for all Californians. 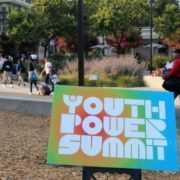 You can learn more about the Youth Power Summit here. 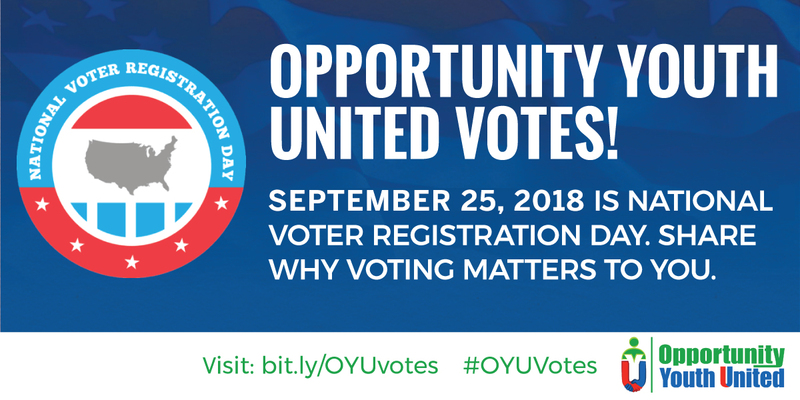 You can learn more about OYUnited’s Community Action Teams (CATs) in California and around the nation – and get involved! – here. Adam Strong is a founding member of OYUnited and member of our National Council of Young Leaders. A passionate advocate and lifelong learner, he has six years of experience in national policy advocacy, using his skills in policy analysis and communication & strategy he aims to influence policymakers to implement policies that increase economic mobility and decrease poverty in America. More from Adam. 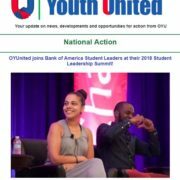 Community leaders from OYUnited’s National Council of Young Leaders gathered in Washington, D.C. and New Orleans to speak on panels and engage other young leaders. Read the full archived August newsletter here. 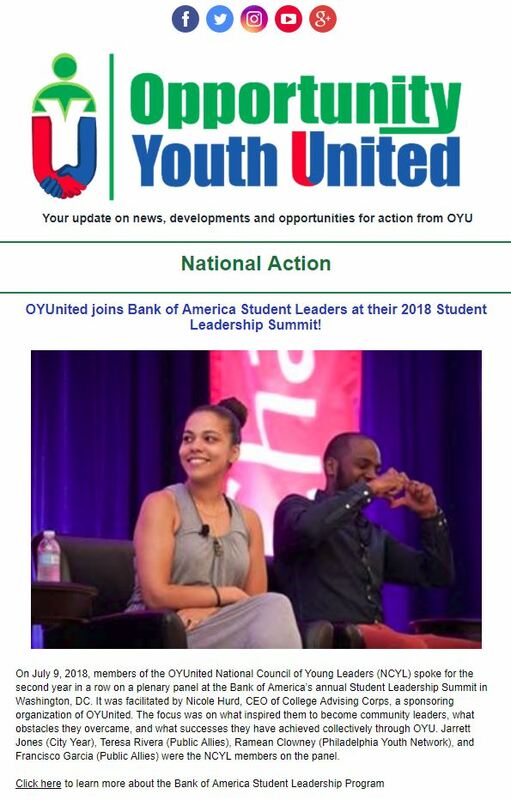 OYUnited leaders lead and, participate in workshops in Washington, D.C. and Massachusetts, Massachusetts Governor Charlie Baker sign into law a bill that promotes improvements to the court system, and more. Read the full archived July newsletter here. From May 18 to 20, more than 400 leaders gathered at the Marguerite Casey Foundation’s National Convening in Washington, DC, to celebrate their work, their communities and their power. OYU leaders were among the grassroots leaders, students, parents, artists, spoken-word poets, and organizers who explored what power really means, what it takes to build and grow a movement of low-income families, and how to disrupt and dismantle structural causes of poverty. During the convening, OYU leaders and members facilitated a breakout session focused on building power among young people. 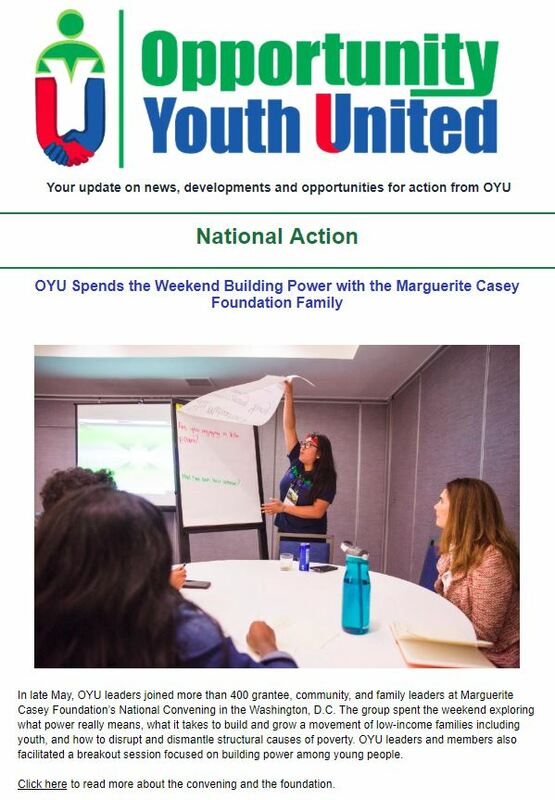 Learn more about the convening on the Marguerite Casey Foundation site: Our Power. Our Community. Our Change. Opportunity Youth United members are invited to join Everyday Democracy for an intergenerational equity webinar on Wednesday July 25th. The session will feature our work, as well as that of our friends at the Youth Voice Project in Boston. 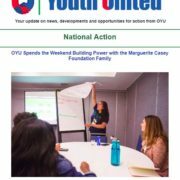 What: Best practices for building intergenerational equity in your work, through the experiences of Youth Voice Project and Opportunity Youth United. More on the session: What is intergenerational equity? Everyday Democracy defines it as the practice of treating everyone fairly and justly regardless of age, with special consideration to the structural factors that privilege some age groups over others. We do this by building strong relationships and partnerships, sharing power across generations, creating mentorship and cross-generational learning opportunities, and making space for youth voice. This webinar will explore best practices for building intergenerational equity in your work. Youth Voice Project will share their experience in developing intergenerational conversations that provide a welcoming space for people across all generations to enter and tell their stories, voice their opinions, and organize together to create sustainable solutions in a concrete way. 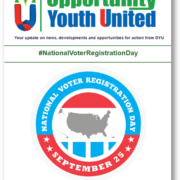 Opportunity Youth United will discuss their national work and how they organize young leaders and adult allies to work together and build power within communities. Learn more. This webinar is free and open to the public. 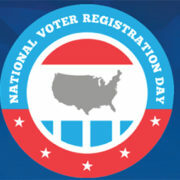 You must register to join. 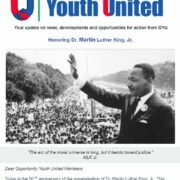 OYUnited gives young leaders a space to share their voices, reflect on their lesson learned, and further develop their leadership skills. Read full archived June newsletter here. 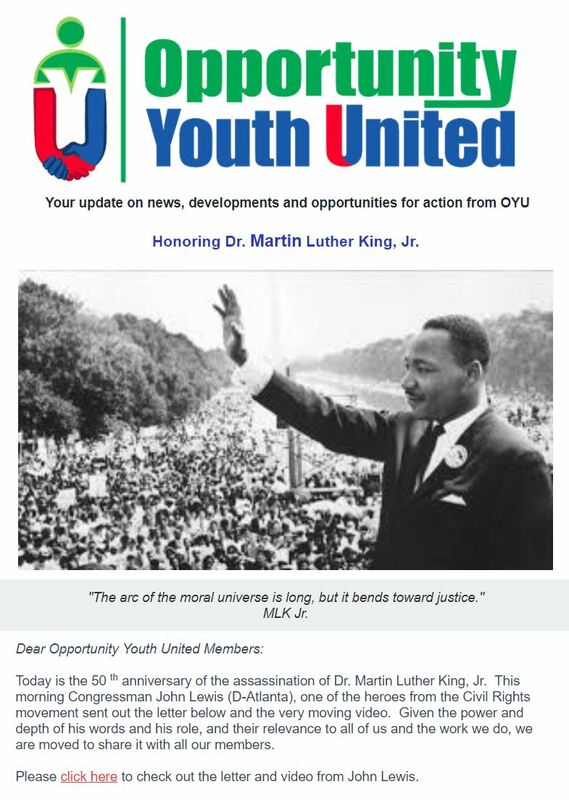 Celebrating the 50th anniversary of the assassination of Dr. Martin Luther King, Jr., the March for Our Lives in DC, OYU’s retreat in Phoenix, Arizona, and more. Read the full archived April newsletter here.